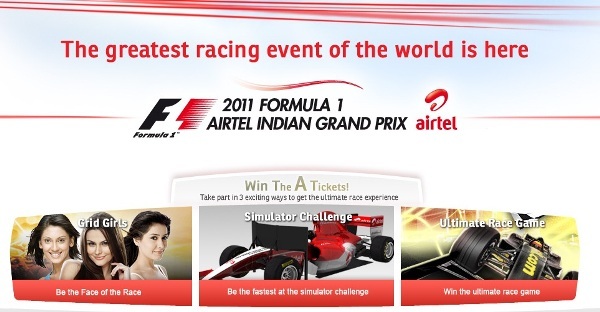 Airtel recently bagged Title Sponsorshiop of Formula 1 race to be hosted at Buddh International Circuit in Greater Noida (Uttar Pradesh, India) on October 30, 2011. As a title sponsor of this grand racing extravaganza Bharti Airtel today flagged off a host of engagement initiatives for F1 fans on http://formula1.airtel.in/ and opened gates for entries for its reality show based hunt for India’s very own Formula 1 Grid Girls. Airtel also announced the availability of its coveted ‘The-A-Ticket’ – an ultimate F1 experience for two, which is now up for grabs for those playing Airtel’s online racing game.